Finca Cortesin Hotel, Golf & Spa’s status as a market leader in the luxury golf resort sector continues to flourish after winning two of the top accolades at the prestigious European Tour Destinations Awards. In addition to receiving the 2018 award for ‘Best Staff Engagement’, the exclusive Spanish resort was also the proud recipient of the ‘Best Staff Operation’ honour for the second year running when the winners were announced at the group’s annual conference, which was held at Finca Cortesin last weekend. Results were taken from European Tour Destinations’ ‘Mystery Shopper’ initiative, with the awards criteria based on written confirmation from staff to visitors. Each member club was assessed on tee times, shop presentation, visibility of marshals on the course, payment information, attention to detail, food presentation and data capture. Miguel Girbes, director of golf at Finca Cortesin Hotel, Golf & Spa, said: “It was a great honour for Finca Cortesin to host this year’s European Tour Destinations conference, and to win two such coveted awards made the occasion extra special. This year’s European Tour Destinations annual conference featured representatives from 20 different venues, with the theme of the three-day event centred around service; product quality and customer engagement; and looking at techniques and innovation from other industries within the luxury segment. Guests also had a full opportunity to experience the extensive world-class golf and lifestyle facilities that Finca Cortesin has to offer including an elegant 67-suite hotel, a 6,000sqm Beach Club; an award-winning spa featuring Spain’s only snow cave; and the choice of four restaurants. For those looking to add an extra layer of privacy and comfort, new for 2019 there are further luxurious accommodation options to choose from with a stunning selection of two, four and five-bedroom villas available to rent – all with full access to the hotel’s superb facilities and a host of attractive extra services included. A three-time host of the Volvo World Match Play Championship in 2009, 2011 and 2012, Finca Cortesin joined the exclusive European Properties Network in 2017, and its membership has helped the resort cement its reputation as one the world’s elite luxury golfing venues. Among the other leading accolades it has won over the last 12 months, the resort’s acclaimed Hotel Cortesin was crowned ‘Hotel of the Year – Overall’ by Preferred Hotels & Resorts – the world’s largest independent hotel brand – while it was also named ‘Best Resort in Spain’ by the country’s Condé Nast Traveler magazine. Opened in March 2006 and set across a vast 532-acre estate, the resort – located in the rolling hills of southern Spain, between Marbella and Sotogrande – is regarded as one of Europe’s most exclusive modern golf and lifestyle destination resorts. Designed by American Cabell Robinson, the venue’s 18-hole, par-72 layout has hosted numerous high-profile tournaments, while complementing the world-class golf course are outstanding practice facilities including a state-of-the-art Jack Nicklaus Golf Academy. 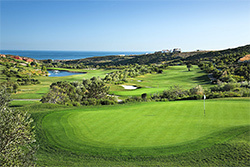 High-resolution images of Finca Cortesin may be downloaded for editorial purposes from here. Finca Cortesin is an independent luxury golf, hotel and spa destination resort set in the rolling hills of southern Spain between Marbella and Sotogrande. Overlooking the Mediterranean to one side and the tranquil Casares Mountains to the other, Finca Cortesin was designed in the style of a traditional Spanish ‘finca’ (rural estate). Opened in March 2006 and set across 532 acres, the exclusive Andalucian development is a member of the exclusive European Tour Properties network. Its world-class facilities include an elegant 67-suite hotel, Hotel Cortesin, a magnificent 18-hole championship golf course with state-of-the-art Jack Nicklaus Academy, a 6,000sqm Beach Club and an award-winning spa featuring Spain’s only snow cave, with bespoke treatments by French beauty brand Boilogique Recherche. Surrounding the hotel is the resort’s acclaimed 18-hole championship golf course, which was designed by world-renowned architect Cabell Robinson. The par-72 course – one of the longest in Europe and which measures nearly 7,500 yards in length – received global recognition when it was given the honour of hosting the Volvo World Match Play Championship in 2009, 2011 and 2012, with the star-studded line-up including Rory McIlroy, Lee Westwood, Martin Kaymer, Sergio Garcia and Luke Donald.